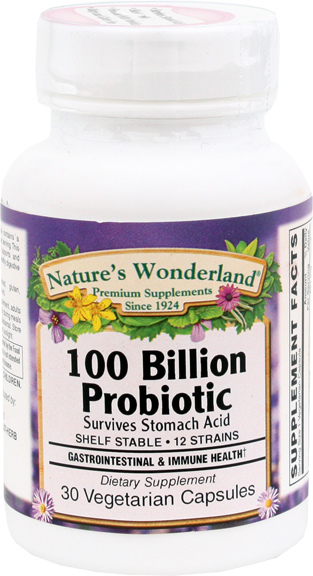 Probiotic - 100 Billion CFU, 30 vegetarian capsules (Nature's Wonderland) - Penn Herb Co. Ltd. 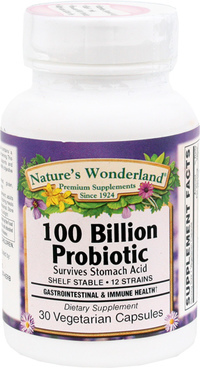 Nature's Wonderland 12-strain blend supports and nurtures good intestinal flora for a healthy digestive system. Each high potency probiotic capsule contains a minimum of 100 billion CFU (colony forming units) per serving. Each 100 Billion Probiotic capsule is specifically designed to survive stomach acid secretions during digestion, eliminating the need for enteric coating. Further fortified with prebiotics for maximum support (prebiotics support the growth of beneficial bacteria). Shelf-stable, 12 strain probiotic blend supports gastrointestinal and immune health; supports and nurtures good intestinal flora for a healthy digestive system. As a dietary supplement, adults take 1 vegetarian capsule daily during meals or as directed by a health care professional.